There’s one big hook setting Monochroma apart from games like Limbo and Contrast: you have to take care of your little brother. Read our review to see if this is a bloodline worth saving. In video games’ ever-growing quest for IMMERSION!, the more cinematic and ‘lifelike’ angle the most recent console generations have strived for has brought about a few new tricks that developers hope will get you invested in the characters, universe, and events that transpire in front of you. One that’s recently grown in popularity is the idea of you having a partner or sidekick of some kind. Be it a squadmate who might sort of listen to your instructions (and could be controlled by a second human, potentially) or a dark-haired damsel who needs you and your Troy Baker voice to navigate them through a hellish landscape, games these days have slowly latched to the idea that you might care more about their game if you have a specific figure to channel that sense of concern into. While Monochroma may look like it’s trying to coast by on just that, the truth is a little deeper than that. Sometimes. Monochroma, the newest title from Turkish developer Nowhere Studios (Turkish! How neat is that?) 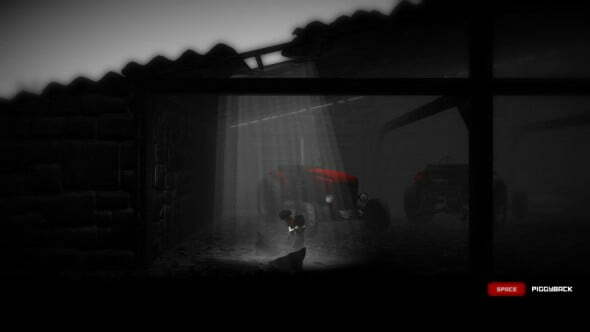 looks on the surface to be a lot like many other moody platformers nowadays; noir-ish graphics with plenty of rainfall and occasional color splashes, physics puzzles, an ambient soundtrack blending a few genres…if you didn’t already know the name of this game, I might be describing Limbo¸ Contrast, any number of recent (and decent) indie titles. There’s one big hook setting Monochroma apart, however: you have to take care of your little brother. Early on in the game, you and your little brother (neither of you are named, and there’s not a single spoken line of dialogue or English word to be found outside of the menus) are playing in a field when things get a little out of hand and the two of you fall through a roof into a barn, rendering your brother unable to walk. You then have to carry him to…somewhere; perhaps you’re seeking help, perhaps you’re just very far from home and have to take the long way back because of reasons. Along the way, you begin to uncover more about the mysterious corporation that seems to control your entire town, and things begin to get a little…darker. Not to say things are cheerful to begin with. The animations and character designs call to mind both vintage stop-motion animation and a French vision of a dystopian future; imagine somewhere between Alphaville and The City of Lost Children and you’re getting close. The score is pretty varied but manages to always fit with whatever you’re doing and, if nothing else, the mood of the game remains well-done and consistent throughout. There’s at least two things in this room that will kill you and your brother before you even know what happened – three, if you try. Consistency, however, is where the gameplay tends to sag. The majority of your time is spent carrying your brother, jumping, and climbing, which all work well enough. Once you arrive at a sufficient light source, you can set your brother down (as he’s afraid of the dark) in order to move more nimbly and solve some of the setpiece puzzles of varying quality. Sometimes you can guess the solution right away, other times you’ll find yourself on the receiving end of a number of increasingly gruesome deaths for you and your brother until you figure out just how long you need to stand on that logging conveyor, or exactly how to stop that flaming oil barrel from exploding again. A lot of the puzzles tend to have much simpler explanations than is immediately apparent, and the game does a good job of explaining the mechanics and physics of the world to you in a more organic way than a pop-up tutorial ever could. But even when the solution is clear, the controls have a bad habit of getting in the way. Pushing and pulling items is generous enough, and the difference in physics between when you are and aren’t carrying your brother is noticeable and well-done. Actually getting around tends to prove problematic, even when your task is just jumping over a box. You never seem to grab onto exactly the ledge you need to when you think you’re going to, and you’ve got a bad habit of not letting go of platforms or ropes when asked. Building up inertia for long jumps tends to be a crapshoot, and the distance you actually wind up jumping doesn’t seem consistent from platform to platform sometimes. The two-tone graphics make it pretty hard to judge height and distance and the iffy collision on some platforms and ladders doesn’t help. None of these are game-breaking by any means, but you’ll likely find yourself piecing together the solution to a puzzle pretty quickly, only to spend more time fighting with the controls in order to put your plan in motion. 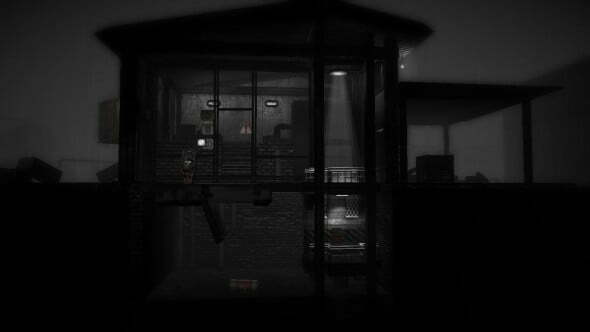 Monochroma doesn't aspire to be much more than an occasionally heart-rending, occasionally bleak, and occasionally challenging platform/puzzle game. And for the most part, it works. The brotherly interplay is subtle but effective, the world looks amazing both graphically and design-wise, and the puzzles are usually well-done...usually. You'll find yourself wrestling with the controls more than you should, however, and this game is maybe the first time in my life I'd recommend your keyboard over a gamepad (for a platformer, at least). Really, the only big problem here is that there's a lot of other games that all do these things just a bit better. If you're really into supporting game development from places outside the US and Japan, you're really hard up for a platformer, or you're willing to look past it's few but significant issues, then give it a try. Everyone else won't really be missing too much.